A generation has passed since the 1980s and 1990s peace accords which promised to end the civil wars and lay the foundation for democratic practice in Central America. El Salvador, Guatemala, Honduras and Nicaragua, however, are today some of the world’s most violent societies. The current migration crisis highlights the fragility of institutions in the region and the failure of its leaders to provide basic security or hope for justice. This institute examines the reasons for mass migration in the region as well as the context of political exclusion, the breakdown of the rule of law, and gang violence which have impeded meaningful reform. Cost: $85 in-service teachers/$25 Education students (includes breakfasts, lunches, and materials). Dorm housing is available for $80/night. 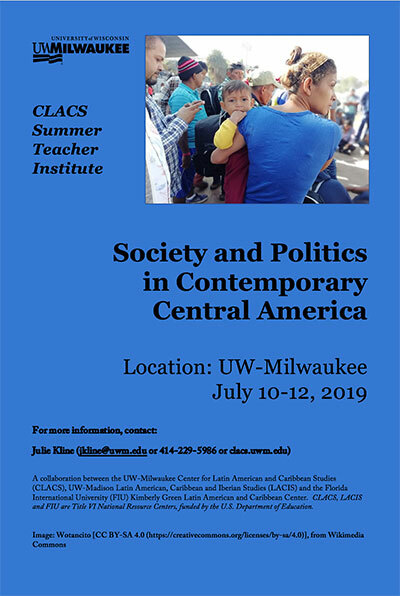 The workshop is a collaboration between the UW-Milwaukee Center for Latin American and Caribbean Studies (CLACS), UW-Madison Latin American, Caribbean and Iberian Studies (LACIS) and the Florida International University (FIU) Kimberly Green Latin American and Caribbean Center. CLACS, LACIS and FIU are Title VI National Resource Centers, funded by the U.S. Department of Education.